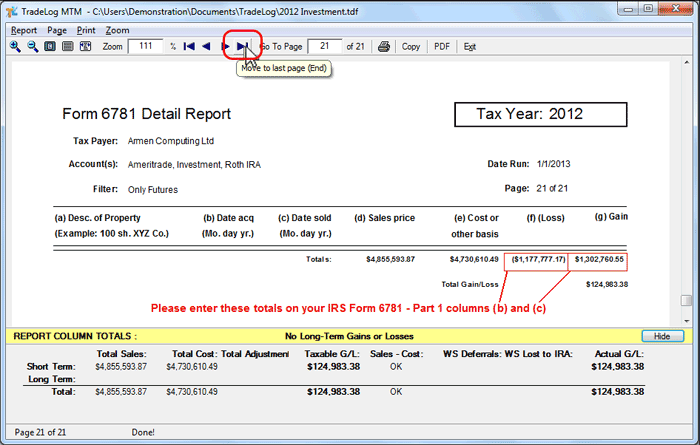 You can run a Gains & Losses Report for Section 1256 Contracts for IRS Form 6781. For final tax reporting, the report should be run by selecting the All Accounts Tab in a multi-account data file. Click Reports, Section 1256 Contracts. The last page of the report will display the totals needed for completing IRS Form 6781. With TradeLog subscriptions that include Section 475(f) MTM support, you may run the Securities MTM report to provide details needed for section 3 of Form 6781. Note: TradeLog does contain an automatic function to be able to directly upload your Futures trading total into tax software. You will need to follow IRS instructions for completing Form 6781.